This year, CHERRY is excited to offer a unique take on the whimsical playground that is Wonderland—an experience that party goers won’t soon forget. From an adventurous trip down the rabbit hole to a spirited exchange with a hookah-smoking caterpillar, one thing will be constant throughout this fantasy-inspired weekend: BEATS. Featuring star DJs Aron (Spain), Micky Friedmann (Germany), Isaac Escalante (Mexico), Susan Morabito (NYC), Alain Jackinsky (Montreal), Kenneth Rivera (NYC), Sean Morris (DC), and X Gonzalez (DC), CHERRY is also thrilled to continue to partner with some of the most progressive names in the international Circuit arena. 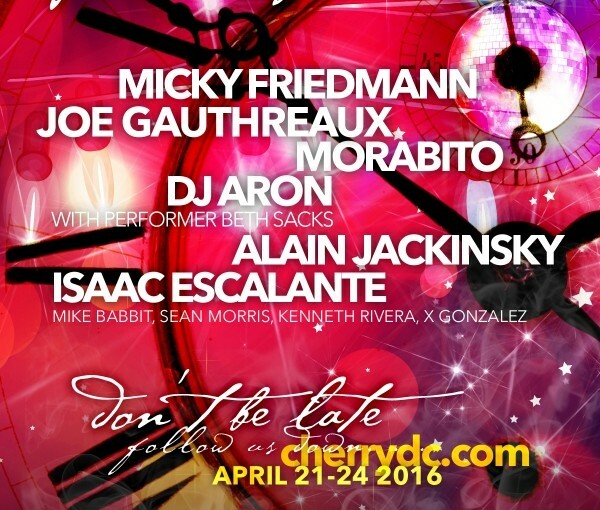 Get your weekend pass to CHERRY Presents: Alice in Wonderland by visiting http://cherrydc.com. PALM SPRINGS, CA — White Party Palm Springs brings new heat to the desert in 2016. All of your favorite events are even bigger and better. Incredible new parties are waiting to be explored, including the totally redesigned Saturday night White Party. Jeffrey Sanker has completely rebuilt his signature event from the ground up to create an experience beyond expectations. It all happens April 8-11 in the desert’s most beautiful oasis. Join tens of thousands of the hottest men from all over the planet as they take over the entire City of Palm Springs for the world’s premier gay dance festival – three days of unforgettable parties! Report for duty Friday night at the all-new Commando Military Ball, fueled by ADDICTED ES Collection. Choose your battle: Gear up in your best uniform or dress down in commando underwear. Join the troops for a full frontal assault happening from 9pm – 5am at the Renaissance Hotel. Secure clothes check available or leave them behind in your room. Saturday, dive headfirst into the fun at WET n WILD Water Park. Grab your swimsuit and shades, all 21 massive acres are exclusively ours, from 11am – 6pm! Get swept away by the sounds of Aussie DJs Dan Slater and Wayne G! We’re making even bigger waves this year with a larger dance floor, party areas, expanded bars and more room to relax and catch some desert rays. With more than 18 water rides, it’s a day of photo ops to last a lifetime. Continuous shuttles bring you right to the action with ease. More than a year in the making – the weekend’s most anticipated moment happens Saturday night as Jeffrey Sanker propels White Party to a completely new level. It’s a 10-hour dance marathon that begins through a jaw-dropping illuminated entrance. Feel your senses erupt and your spirit ignite as the beats and rhythm beckon you to the dancefloor. State of the art lighting and effects shower the crowd in a kaleidoscope of colors and lights. Mind-blowing custom LED visuals spring to life from every angle. Meanwhile, a non-stop flow of amazing entertainment and performers keep you captivated throughout the night.